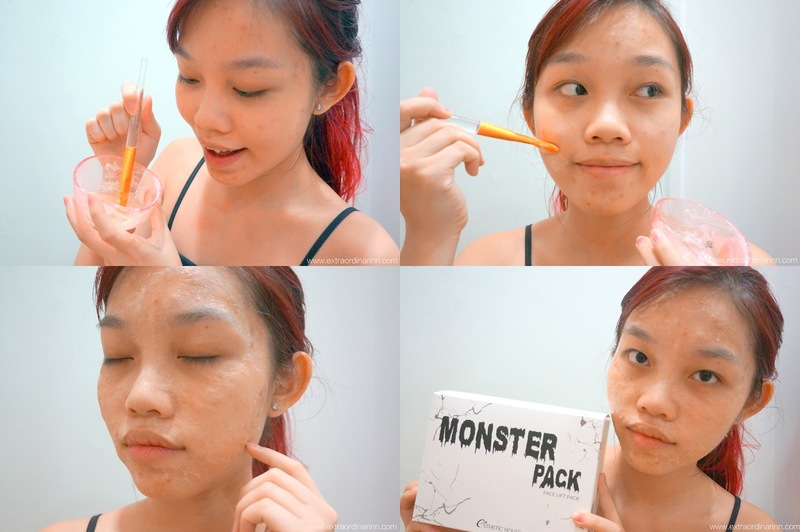 Carinn; carerynn | Malaysia Fashion, Beauty & Lifestyle Blog: Beauty: Unboxing Althea Halloween Beauty Box! Yay, I received this Halloween-themed Beauty Box from Althea awhile back in conjunction with the upcoming Halloween! You've heard me talk about Althea a few times so no introduction needed, I guess :) This box has introduced me to many products that I'd never thought of getting for myself but after trying out every product, I find that they're totally interesting to use yet effective. Lemme introduce you to each product one by one! First up in the box is this Piolang Monster Pack in White. This mask has a strong tightening effect for pore tightening, wrinkle unfolding and sebum absorbing for bouncy skin. The pack contains the 'monster' powder, activator serum, bowl, spoon and a pack brush. The activator contains ingredients like albumin, adenosine, niacin acid, hyaluronic acid, panthenol and whiteflower complex. The pack increases elasticity of the skin, nourishes dry skin, brightens as it cleans skin waste and removes dry skin cells so you'll feel comfortable even with a naked face. All you have to do is mix 2 spoonfuls of powder and serum in the bowl before applying it on your face. You must be wondering why it's called a monster pack? Check out my skin in the pic above. My skin got so weird and wrinkly after 10 minutes of applying the Monster Pack! The tightening effect is scarily tight and after washing it off (peeling is a little painful), my skin became much smoother. Because of the drying and tightening effect, you can use the pack as a pore pack on your nose too! It's suitable to be used on sensitive skin like mine, but I'd advice not using it too often as it might dry out your skin. I was most thrilled about receiving this crayon lipstick set cos I'm a true blue lipstick junkie! The black and white lipstick caught my eye especially (yea, I'm weird, I know). The Velieve Bellamonster Crayon Colour Blender Set contains 6 different crayon-type lipstick + tint + lipbalm for you to mix and match to create new colours! The colours are Pigment Pink, Pigment Orange, Pigment Red as your 'base colour' and Lilac Blender, Black Blender and White Blender to complement the pigment colours. Here's a simple swatch on the lips for you, each colour gives off a different effect. 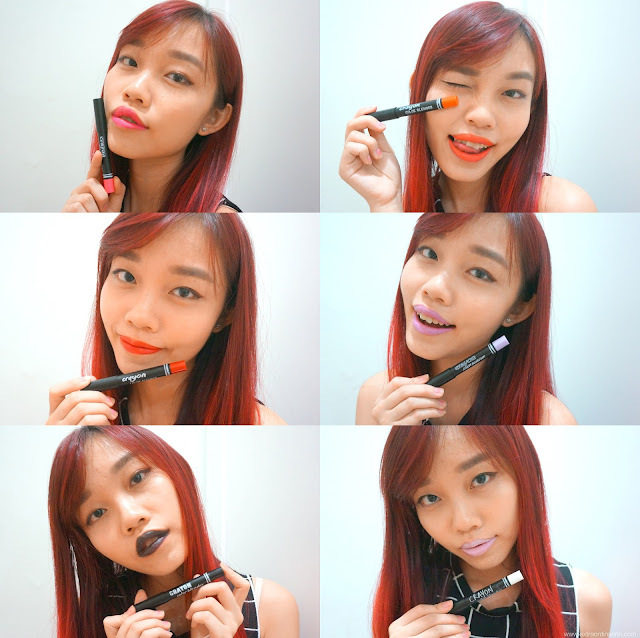 The lipsticks have vivid and long-lasting colour. Because they contain shea butter and ECOCERT French certified Jojoba oil in it, they leave your lips healthy and soft. It's also super easy to use! First, you apply the pigment colour then add the blender colour to blend both colours together. The possibilities are endless! Finally, we have this Elizavecca Hell-Pore Clean Up Mask which is a liquid pore pack. I heard this is so popular that it's sold out everywhere in Korea! It contains dead skin cells, cleanses pore wastes and reduces pore size. It contains 4% of clean charcoal to remove excess sebum, Chinese peashrub to stabilise the skin and camellia flower for added pore care. You can use it as a facial mask or just a pore pack for nose. After applying a thick layer, just leave it on for 15 minutes. Then, peel it off slowly, You will see all the dead skin cells and blackheads removed that your skin becomes smoother after that. I like that it's more convenient than normal nose pore packs that has a few steps to it, this is a one-step solution that works! I think the choices in this Halloween box is pretty creative and scaaarrryyy~~ The Althea team is so creative! FYI, Althea has recently launched a limited edition Cute & Trendy Beauty Box recently. If you love this box, then you'd want to collect their cute beauty box too! There's also an ongoing promotion to spend RM99 (instead of RM150) and get free shipping until 31st October. There's still time, hurry up and place your orders! I know I'll be placing mine tonight ;) Happy Halloween!! OMG I love the lipsticks! Black Blender is so chio!